Hillary held a live town hall on Good Morning America today. The Coffee with the Candidates spot was occupied by the Dem frontrunner and questions came from the panel, the studio audience, a few outside locations, and from social media. Asked about Donald Trump’s latest nickname for her, she said she is not going to respond to his personal attacks. Regarding Bernie Sanders, she will leave it up to him to decide what his campaign will do. Even though Bernie’s supporters do not support her now she will continue to support them. She will keep talking about her agenda. Speech transcripts: This is a new standard. When everybody releases theirs, she will release hers. Meanwhile, it is the tax returns that are the standard, and Sanders should release his. 1994 Crime bill: She pointed out that Sanders voted for that bill. She will divert people away from the criminal justice system; provide second chance opportunities; restore voting rights. What would she say to people who don’t trust her? When she gets a job everyone says she does it well. President Obama trusted her. Stephanopoulos asked where she thinks this comes from, and Hillary said it’s a long term thing. People are fine with her and praise her when she is doing a job, but as soon as she runs for a job, they attack. Greatest political regret. Iraq War vote. Marijuana question. She would have to study a bill before signing on but is interested in what is happening where it is legal. Recommends acquire evidence and make decisions based on that. Pay gap: Laws permit people to be fired when they try to get information about their comparative pay. Those need to be addressed. Young women start out in parity and the disparity grows over years. Which Hillary came closest? There’s a little bit of truth in all of them and the history of the hairstyle is like an archeological dig. Learning from the skits: She is not a natural politician and it doesn’t make good TV but gets good feedback from the impressions. Loved playing Val the Bartender and may bring her back. #TBT: 1988 GMA appearance: Was about fighting sexism and pay inequality in law practice. Is campaigning on breaking barriers – so many barriers. Has been using hot sauce since 1992 to boost her immune system. Has a collection. Bill’s most annoying habit. Reading himself to sleep. Since he’s asleep bed, she has to get up and turn out his light. My take: The audiences at these events are politically active. That is clear. (Did I not see Jennifer McCann there? She is everywhere!) Also, questions are screened. That’s how the questions get up on the screen so quickly. So have these people simply not been paying attention? She has answered these same questions ad infinitum and really never gets a new question. Every audience, full of activists, comes up with the same questions. I bet Jennifer submitted a question. I bet it was about plans for disabilities in the workplace – something like that. Why do the producers keep pulling the same old questions out of the hat and not give Hillary a chance to answer new ones? I have a feeling there were better questions in that audience. Questions with answers a lot of voters have not heard her answer before. How the heck is Hillary supposed to explain the people who do not find her “trustworthy?” That is a question for them, not for her. Why does that one keep coming up? That’s just me. Discussing the mean side of campaigning, she said that over the years she has grown a tough skin and joked that she has a great cream for anyone who is interested. She suggested a contest to decide WJC’s official title should she prevail, and the ladies brought up grandmotherhood which she is enjoying immensely. They gave her a pair of pantsuits: one for Charlotte and one for the new little one coming soon. It was a lovely visit that concluded with the obligatory selfie. Reminder: Look for Hillary on BET tonight at the Black Girls Rock event and again later ABC will rebroadcast Hillary’s last visit to Jimmy Kimmel in case you missed it or want to see it again. With Jake Tapper on CNN’s State of the Union, Hillary discussed, among other things, the water crisis in Flint, Michigan (where she is going today), the Sanders campaign allegations on banking influences, and the “shout out” from male pundits. She is very well-informed on the subject of lead poisoning from both a medical and an infrastructure point of view. She knows what needs to be done, medically, for the children exposed to the toxic water, and she also knows what needs to be done to the water lines. Do any other candidates from either party have the battery of information on this subject that Hillary has? She explained, once again, how her financial plan is broader than Bernie Sanders’s plan as she also is going after giant corporations that gouge the public and evade taxes. She said she doesn’t understand why he doesn’t join her in this battle. As to the shouting, she said we all know that we are still dealing with a double standard and that sexism is not a thing of the past. By the way, anyone who listened to her at her Portsmouth event last night must admit that her normal tone at rallies is conversational not the full-volume blast that Bernie continually puts out. On This Week with George Stephanopoulos, she voiced her appreciation of Bernie’s SNL stint. She also took on the extreme remarks of Marco Rubio on abortion in last night’s GOP debate. There, too, she took on the spin about the bankruptcy bill – specifically with regard to the effect of the proposals on separated and divorced women and their children. She said she is not going to take the Sanders smears anymore, but largely, she was arguing against comments by Elizabeth Warren there. As to the Goldman Sachs speeches, she said everyone who has given speeches to private organizations should then release their transcripts and the standard, if this is going to be the new standard, should apply to all. She also discussed the Flint situation on Meet the Press. (That repeats later on MSNBC.) She was on Face the Nation as well. That repeats later on CBSN. Hillary spent part of her morning today with Kelly and Michael. She talked about her campaign and her experience. On the lighter side, she sat in the ‘hot seat’ where she admitted to a weakness for chocolate, thinking she is a pretty good singer, and being a worrier. She also had advice to parents about how to talk to children about recent terror threats. We should be honest, but not instill fear. Her advice is to answer questions as they come up at a level the child can understand. Shortly, she will deliver an address at the Council on Foreign Relations regarding her plans to combat terrorism. The speech will be carried on C-SPAN.org. Back home in New York, Hillary will visit with Kelly and Michael tomorrow morning, and then she will outline her plan for defeating ISIS. Dallas (CNN) Hillary Clinton will outline her plan for defeating ISIS on Thursday in New York City, her campaign said. The speech, which comes in the wake of the Paris terrorist attacks that took the lives of more than 130 people, will outline Clinton’s “strategy for defeating ISIS and eliminating the immediate threats it poses, as well as her plan for combating radical jihadism more broadly,” the campaign said in a statement. “Clinton will lay out her vision for the role American leadership must play in supporting our allies, protecting our homeland, and forging a safer world,” the statement added. On Friday, she will be in Tennessee and speak at Fisk University. NASHVILLE, Tenn. (WKRN) – Presidential hopeful Hillary Clinton will be in Nashville Friday to speak at Fisk University. Ahead of the Tennessee primary on March 1, Clinton hopes to build support and a grassroots organization. She’s expected to speak on why she’s running for president as well as who and what she will fight for if elected. A presidential candidate is making a campaign stop in the Mid-South. 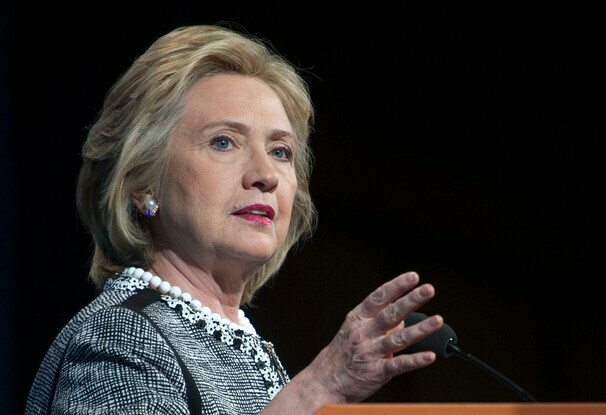 Democratic presidential candidate Hillary Clinton will be at the historically black LeMoyne-Owen College Friday. The campaign stop is open to the public but you must RSVP. It will start at 2:15 pm at C. Arthur Bruce-Jerry C. Johnson Hall. We know the upcoming release of Hillary’s memoir will be accompanied by TV appearances in addition to the anticipated book tour. Now we know who got the first word with her. The media blitz surrounding Hillary Rodham Clinton’s forthcoming memoir is coming into view, with ABC News scheduling a one-hour primetime television special featuring Clinton on the eve of her book’s release. The network announced Tuesday that the former secretary of state and potential 2016 Democratic presidential candidate will sit down for her first interview with Diane Sawyer, anchor of ABC’s “World News,” to air during a primetime special at 9 p.m. on June 9.